Food, glorious food, is central to the Christmas experience but the opportunity for feasting and sharing festive fun and laughter can be thin on the ground for older people who live alone. This year’s Abbeyfield Society Coping at Christmas campaign is putting the spotlight firmly on food and is inviting over-55s who live alone into its 500-plus homes and houses around the UK to share free Christmas meals, cake and of course companionship, laughter and warmth. Good, home cooked food combined with company is a real tonic, and it’s especially pertinent at this time of the year when many older people find themselves alone. Indeed, 89 per cent of older people surveyed in a recent poll commissioned by Abbeyfield said that company was crucial to a good Christmas. Of those surveyed, 73 per cent felt that sharing food in the company of others was an essential ingredient of a good Christmas. 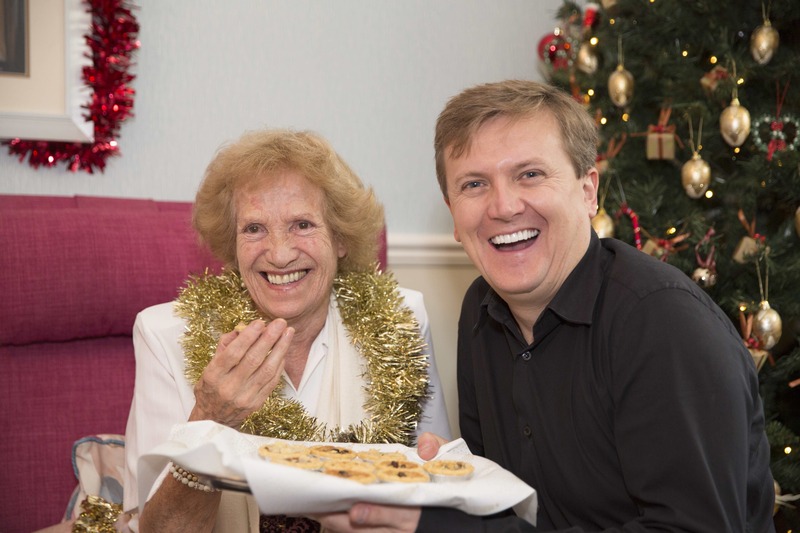 Presenter and singer Aled Jones launches Abbeyfield’s Coping at Christmas campaign. Research has found that food and company are vital ingredients for a happy Christmas to older people living alone. Elizabeth is a 90-year-old grandmother who was widowed 40 years ago. Her children – now grown up with family of their own – are spread out around the country. Elizabeth suffers from chronic mobility issues, which means she rarely leaves her home. For the last two years Elizabeth has enjoyed Christmas at her local Abbeyfield House. And this also means she enjoys a proper, home cooked Christmas lunch – something she wouldn’t bother to prepare or make at home. More importantly, it means Elizabeth meets and eats with other people, sharing conversations and making new friends. Aled Jones, whose angelic version of The Snowman theme Walking In The Air, will forever be a part of Christmas. Aled, a patron of Abbeyfield, said: “Imagine Christmas Day without Christmas dinner. For many older people who live on their own, that is their reality. Thanks to Abbeyfield’s Coping at Christmas campaign, it doesn’t have to be. They are throwing open their doors to offer lovely food, lots of Christmas activities and companionship – all things that can make a huge difference to older people’s quality of life at any time of the year, but no more so than at Christmas. Coping at Christmas 2015 launches on November 19 and will offer company, companionship, free events, entertainment, overnight stays and of course fabulous festive food to over-55s living alone across the UK. If you or anyone you know is interested in finding out more about Coping at Christmas or would like to know about an Abbeyfield event near you, call the Coping at Christmas hotline on 01727 734077.